Sometimes it only takes a little something to bring it all together. Yesterday I got my first Gudrun Sjoden parcel (as I’m a new client it included a lovely gift: a little tote bag and a spotty scarf). This genius blue stripy top was in it. This is what you would call a smart basic. Thanks to it I was able to put together a new outfit in no time. 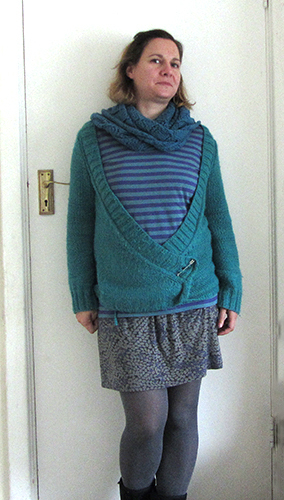 The dress, shawl and cardi were never to meet one another otherwise. Plus I love how bold the pattern association looks. And the colours surprisingly mix together quite well. I am sure if I took some time I would be able to put together two or more other outfits based on my new favourite stripy top. Funny how things happen like that! Everything falls into place from nowhere.